I'm basically in love with ombre anything. Who knew? I sure as heck didn't. With all these design fads rolling around (*cough*chevronstripes*cough*weirdlyplacedtriangles*) I've been sort of not digging them as much as I thought I would. But then enter ombre colored things and wham! I'm in love. "So I was thinking we should paint something a new color in here!" "Sure!! What are you thinking we should repaint?" "Oh....our lamp, coffee table, book shelf, picture frames, side table, bar stools, and tv cabinet." Insert ombre. I wanted to ombre something...anything...I needed to ombre something actually. I needed to have that happy lovely look in my home. Insert lamp. I've had this lamp FOREVER. Seriously. It was one of my first "big" purchases I made once I got my first job. Not first full-time job, first job. So we're talking 17 years old or something...making like...$63 a paycheck...what do I go and buy? A lamp from Urban Outfitters for something like $100. I wish I was kidding. That retarded lampstand was $75 alone!!!! Aggggg. *Slaps head with hand* If I only knew then what I knew now. Anywho, 10+ years later and it's getting covered in spray paint! Ha! This project was SO RIDICULOUSLY EASY. All it takes is a little prep work (and some patience...which I don't have) to make an old thing look new, and with OMBRE effects all over it! I know not everyone went out and bought this "must have lamp" back in the early 2000's...maybe you did. I hope you didn't. But if you did, yay! Welcome to my club. 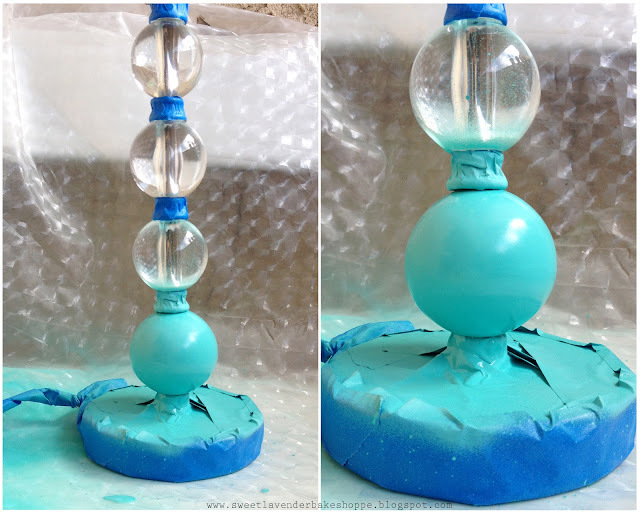 If you didn't- but you're still wanting to ombre some lampstand you have- great- the process and steps will work just as much. Just alter the parts that don't apply to you. Here are the colors we chose to use. We're pretty much in love with all things blue, turquoise, etc...so it only made sense. But please feel free to use a different set of colors! An ombre of golden yellow would look great too! Or even a dark blue to dark pink ombre! Montana Gold spray paint in "Window"
Painter's Touch spray paint in "Aqua"
Montana Gold spray paint in "Fresh Blue" <-- IN LOVE with this color! Painter's Touch spray paint in "Ivory Silk"
Now let's get started, shall we?!? First off, take your old lampstand (or new one that you're wanting to make more your own..whatever the case) and wipe it down with a damp cloth! Make sure to get any dust, dirt, sticky goo, whatever may be on that thing OFF! Any bumps from dirt or dust will for sure show up! Dry off or allow to air dry completely. 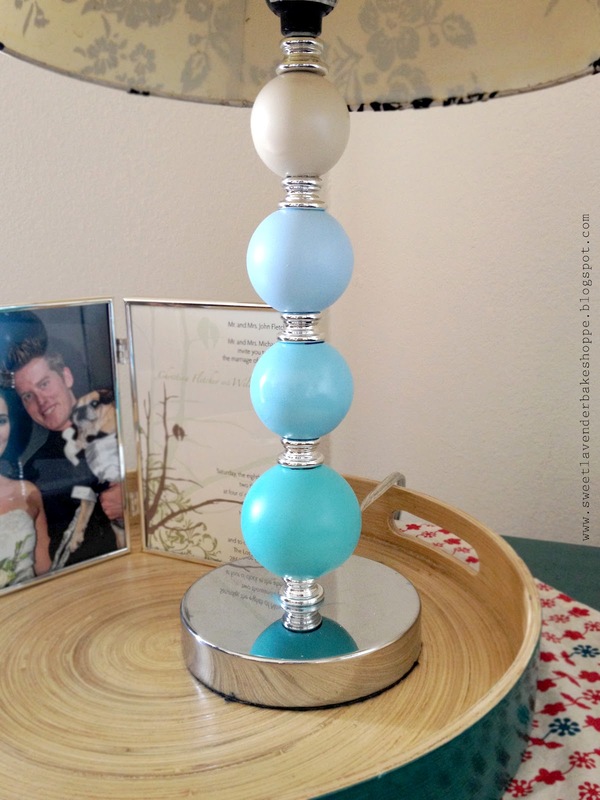 For our specific lampstand, we wanted to allow the silver spacers to shine between the ombre balls, so we decided to cover them (and our base which was also silver) up with painter's tape. If you have an area on your lampstand you would like leave paint-less, now's the time to cover it up! And cover it well! Also, good to note to cover up the lightbulb thing-a-ma-jigger at the very top as well as your cord. Next, create a little shield out of paper! This is what you're going to use to cover up your lower balls on the lampstand after they've been painted. We definitely don't want that nasty over spray to show up on our nice and newly painted parts! 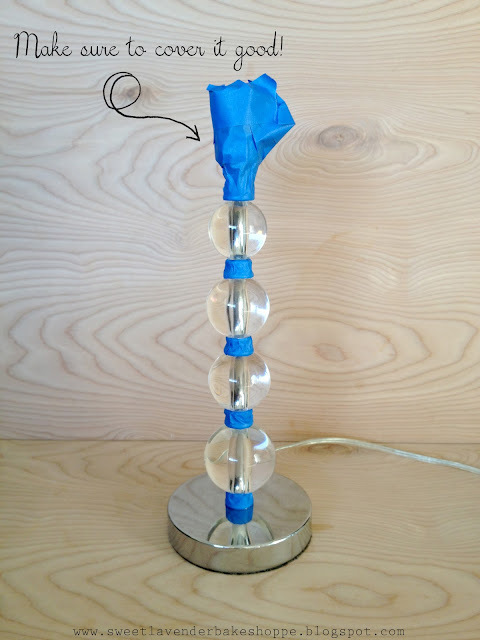 Take a piece of string and measure the circumference of your lampstand. On a normal 8.5x11" sheet of paper, trace that size of string in the middle of your paper. Starting at one end of the paper, cut a slit up till you hit your circle. 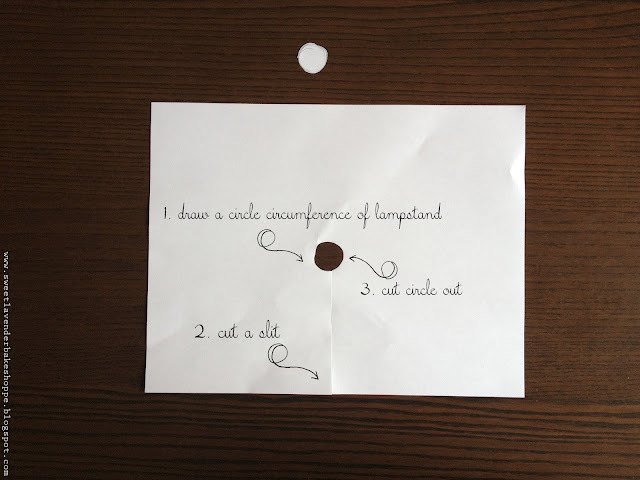 Cut circle out! Viola! You have a shield. You'll see what I mean, soon. Once you've got your shield and your lampstand is cleaned and dried, you're ready to paint. Find a super well ventilated area and make sure to cover it up with an old blanket...or a tarp. We had an old shower curtain, so that's what we used. Whatever it is you choose, make sure it's thick so the paint won't leak through. We placed an old chair under our shower curtain to make a sort of bench/shelf to work on. We're going to start painting from the bottom up. It's a lot easier this way! In nice even sprays, carefully cover your bottom ball with your first color- we used Montana Gold's "Window". Make sure to cover the very tip top and very bottom just as good! To paint with spray paint just make nice short swift back and forth motions with your spray paint about 4-5 inches from the surface. Don't worry too much about the ball above, it will be covered by your next paint job. :) I mean don't go bonkers painting it as well, but a little over spray won't hurt ya. Once covered, allow to air dry for at least 20 minutes. With the types of spray paint we used, we only needed to do one coat of paint. Score! Now time for that shield action! After 20 minutes, your bottom ball should be dry to the touch. 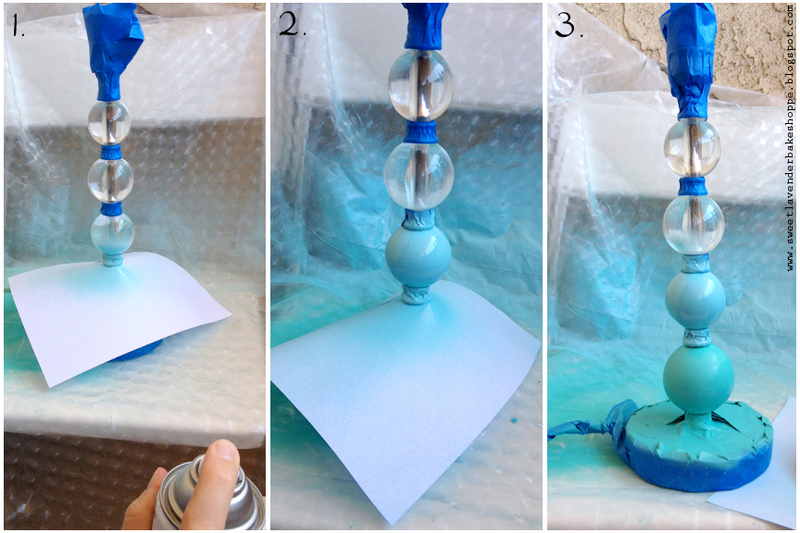 Carefully and gently take your paper and wrap around base of lamp above the painted ball. 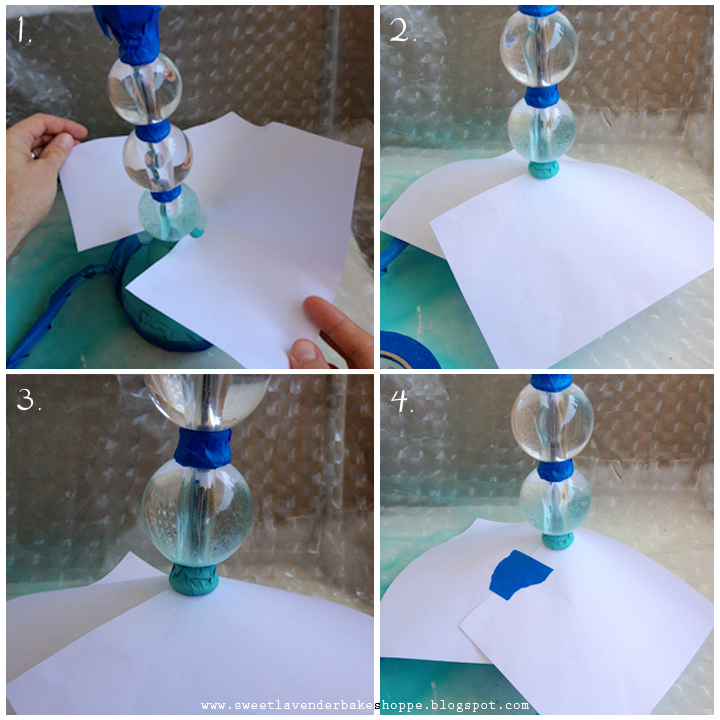 Pull sides of paper together. Try not to put too much pressure on bottom ball while doing this. The paint is dry, but only "dry to the touch". 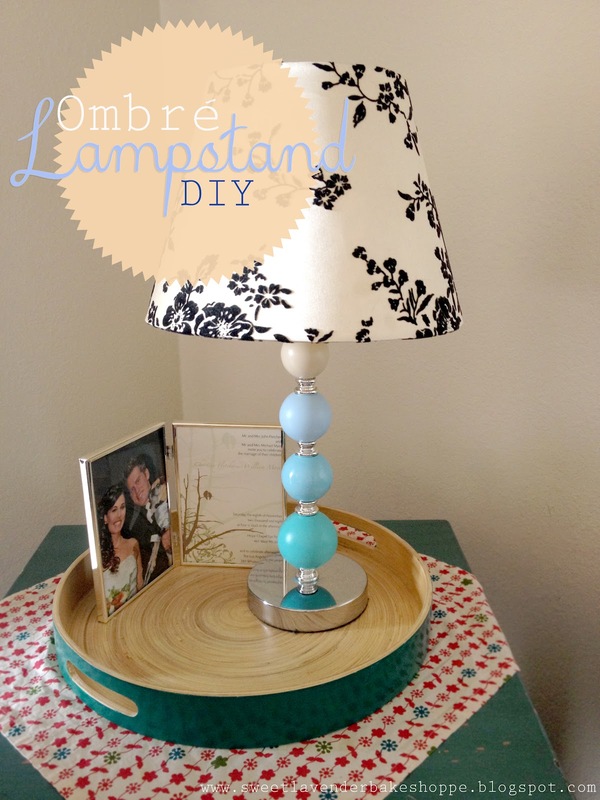 Overlap the paper a tad to create a nice tight "seal" around the base of lamp. After your base is wrapped in that shield, you're ready to paint your next ball. 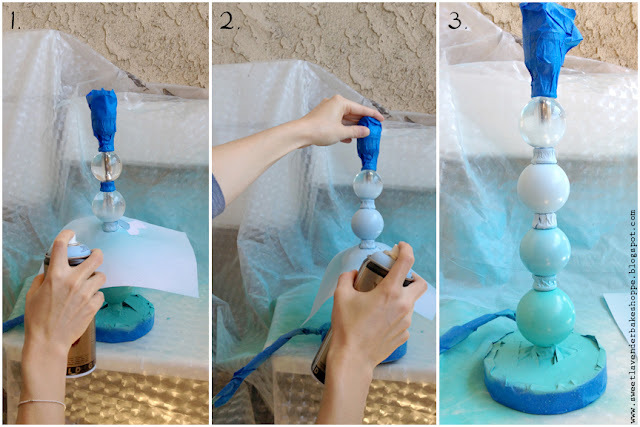 Carefully spray next ball in your second (lighter) color. We used Painter's Touch in "Aqua". Remember we're working from bottom to top. Once you've covered your ball evenly with paint, carefully remove your paint shield and let air dry another 20 minutes. After you've let your second ball dry 20 minutes, cover with your paper shield like we did the last ball. Again carefully, so we don't interrupt that lovely even painting job we just did. In nice even swift back and forth motions, color your third ball in your third (even lighter) color. For this we used Montana Gold's "Fresh Blue". Once nicely covered, carefully remove shield again, and let dry...you guessed it...another 20 minutes. After the 20 minute drying time, cover your third ball with your paint shield, making sure to tape closed. Paint evenly (you get the point), remove paint shield, and let dry *drum roll please* another 20 minutes! <-- Bet you didn't know that was coming. You're done! 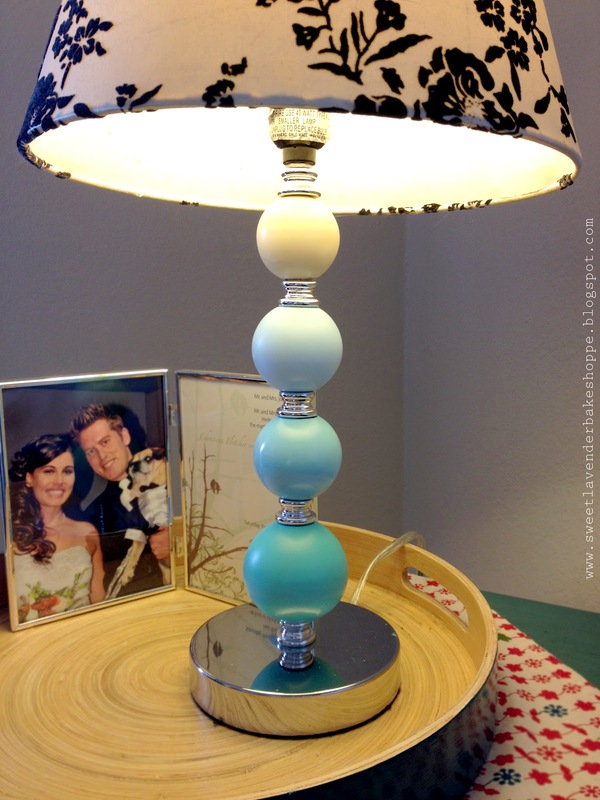 Just screw back in your lightbulb and place your shade on and voila- look at you! YAAAAAAAAAY! Pretty neat huh??? We debated painting those silver middles, but I'm glad we decided not to! 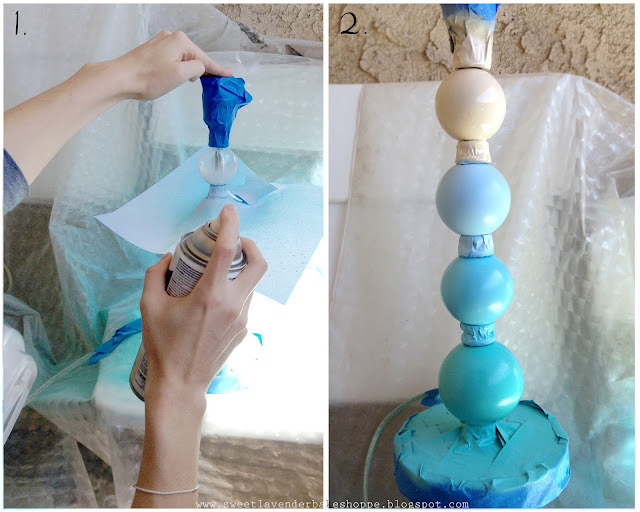 There you have it...a super easy ombre DIY you can do in one simple weekend. Let me know if you guys try this- or ombre something else! 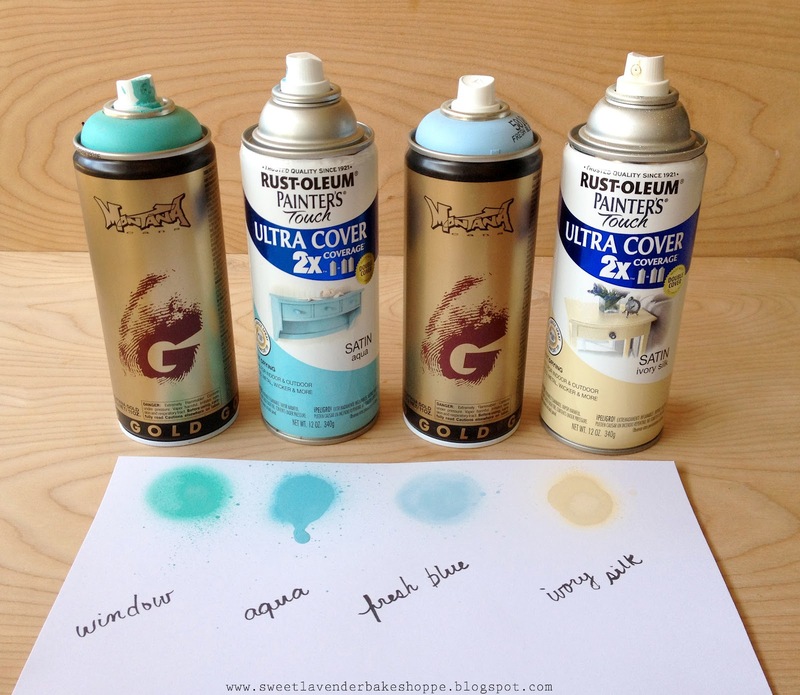 Great colors, great tips, awesome awesome! Can you tell I really like it? I have a set of lamps just like that from Target. I was just thinking how boring they are starting to look... but now I think I know what I am going to do with them! Oh awesome!!! Please please share pics! This is adorable! I wish I had a lamp to do this with but ours are all boring, straight steel looking rod things. Boo! WOW juѕt what Ӏ waѕ searching fοr. Ι love your blog.. vеry nice сοlors & themе.